I have been enjoying experimenting with side dishes recently and I hope to share them with you. this is an apple-sweet potato dish and I think that apples added to almost any dish is a plus. When I came across this recipe and saw the word, "apples", I was sold. The orange juice added a nice flavor the remaining ingredients and we liked this dish. Bake at 400° for 1 hour or until done; cool slightly. Peel and cut crosswise into 1/4-inch-thick slices. Place apple slices in an even layer in a lightly greased 13- x- 9-inch baking dish. Top with sweet potato slices. Stir together 1 1/2 cups orange juice and next 7 ingredients. Pour over sweet potato mixture. Spray top with cooking oil. Is it a sin to want this sweet bake for the breakfast? It looks so good, Chaya. Looks and sounds delicious! I imagine the orange juice flavor takes it over the top. I'm visiting from Tuesday's Table blog hop. What a lovely way to serve sweet potatoes, Chaya! 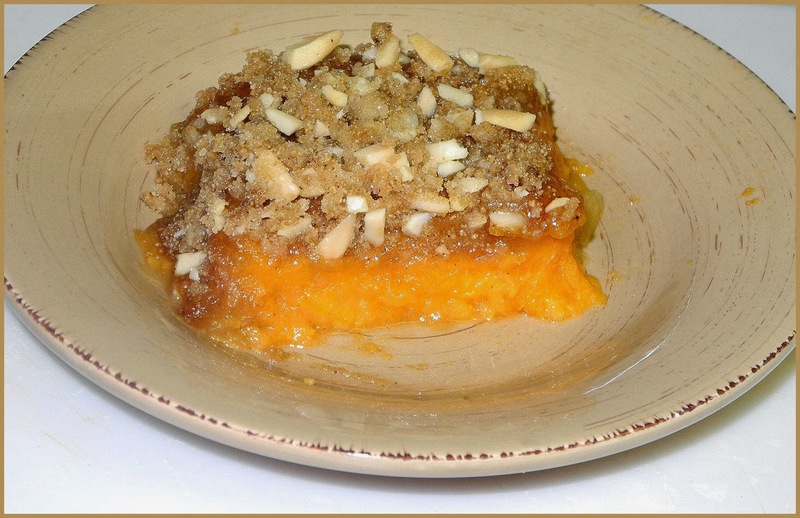 Thank you for sharing you Apple-Sweet Potato Bake with us at the Hearth and Soul hop.